Eleventh Hour is the creation of guitarist and composer Aldo Turini, helped along by some fellow Italian musicians. These include Luca Mazzucconi (N.F.D, Lahannya) on drums, GianMaria "Black Jin" Godani on bass, Alberto Sonzogni (The Black Phoenix, Timesword) on keyboards and, perhaps more notably, the ubiquitous producer and multi-instrumentalist Alessandro Del Vecchio on vocals. He also helped write many of the songs as well as handling the mixing and mastering. Memory Of A Lifetime Journey is their debut album, so what's inside? 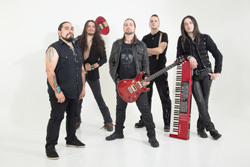 Plainly, the Eleventh Hour sound is melodic heavy power metal, embellished with orchestration and keyboards. The former is largely the core of every song with All I Left Behind, Long Road Home, and Sunshine's Not Too Far representative selections. The latter, the orchestration side of things, is nicely displayed within the anthems Sleeping In My Dreams and Here Alone, which also features soprano Susanna Carboni. These two songs are by far my favorites, the top picks of the album if only for that same orchestration and vocal arrangements. I don't normally think of Alessandro Del Vecchio as a vocalist, though has done so many times in the past, but his voice is nearly impeccable on these songs. Otherwise, the rest of music and songs on the album is fairly typical of the Eleventh Hour's chosen genre. That's not to say that this is a mediocre album. Certainly not. The songwriting and musicianship is quite fine. But the music may seem quite familiar to you. However, in the end, Eleventh Hour's Memory Of A Lifetime Journey is spot on classic symphonic and melodic power metal, and definitely worth your interest. Recommended. 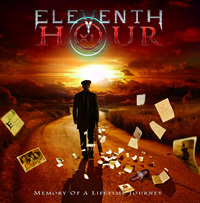 Eleventh Hour's Memory Of A Lifetime Journey is spot on classic symphonic and melodic power metal, and definitely worth your interest. Recommended.